2. Ginkgo Biloba: It has rich ginkgo flavone to clean all the harmful substances. 4. Honeysuckle: It clears away heat and toxic material ,solve the problem of swelling and aching of gum . 5. Mentha Haplocalyx: It freshers your breath,brings you a good mood and makes you more confident. 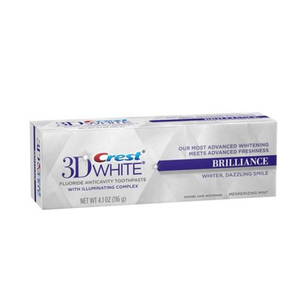 Features: Our most advanced teeth whitening formula meets advanced freshness. I will then invoice you with the correct shipping charges. I am always happy to send you measurements to help you in your selection process. P&W Oral Care(Shenzhen) Co., Ltd.
That's why there are two steps in the new Crest 3D White Brilliance 2 Step Toothpaste. Use them together to keep your smile as white as a Professional Polish*. The item must be returned in the same condition as it was sent. Triple in density and whitening effect compare with regular strips, this strip is produced with matrix heaping and double coating technology. Free of chemical odors, this strip brings in a fresh, free of ache and thrill experience in teeth whitening. They safely penetrate enamel and dentin to clean pigment and stains, so as to whiten teeth. It is the same product as the ENGLISH Character version one!! After removing the CHINESE sticker, you can see the original packaging of ENGLISH version. So, the CHINESE version of the packaging is the same as the ENGLISH version one. Tee th Whitening strips for night use We are manufactory. All your inquiries will be answered in 12 hours! ! ! 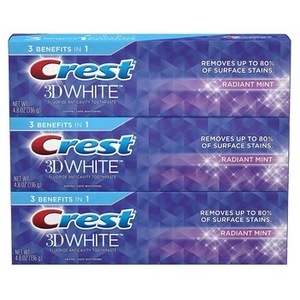 CREST Whitening Toothpaste with Baking Soda , 3.5 oz. Plus, it has a fresh mint flavor that leaves mouth and breath feeling refreshed. tubes of CREST whitening toothpaste with baking soda. 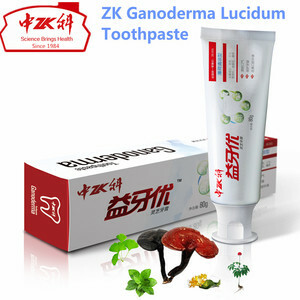 Filam Imported Beauty and Health Products Co.
Alibaba.com offers 155 crest toothpaste products. About 27% of these are toothpaste, 9% are teeth whitening, and 1% are hotel amenities. A wide variety of crest toothpaste options are available to you, such as free samples. There are 69 crest toothpaste suppliers, mainly located in Asia. The top supplying countries are China (Mainland), United States, and Austria, which supply 28%, 23%, and 15% of crest toothpaste respectively. 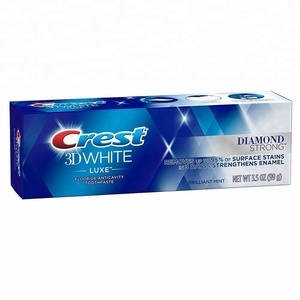 Crest toothpaste products are most popular in Domestic Market, North America, and Western Europe. You can ensure product safety by selecting from certified suppliers, including 13 with Other, 5 with GMP, and 3 with ISO9001 certification.